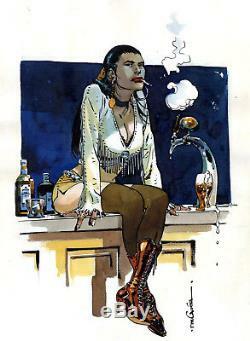 Scalped Deluxe Hardcover Volume 4 Cover by RM Guera! COMMENTS: One of only a handful of original SCALPED covers from series artist and co-creator RM Guera, t. His cover was originally used for the French market publication of TPB 7. It is now the cover to Deluxe HC Volume 4 here in the States! Art measures approximately 9x12, mixed media on watercolor paper. Guera SCALPED DELUXE HARDCOVER v4 Cover Painting Original Published Art" is in sale since Tuesday, November 21, 2017. This item is in the category "Collectibles\Comics\Original Comic Art\Other Original Comic Art".
" and is located in Nashville, Tennessee. This item can be shipped worldwide.